No, you haven’t already read this test in other magazines. 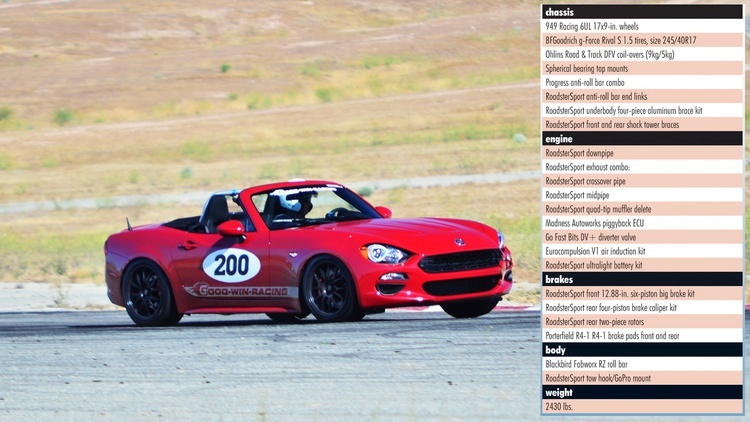 Sure, you’ve seen the headline “Fiat 124 Spider vs. Mazda MX-5 Miata” in a million other places, but never like this. We’re not simply comparing showroom-stock examples of the platform-sharing roadsters. We’re not going to comment on the Fiat’s acoustic windshield or the Mazda’s smaller trunk. We’re going to compare track cars on track, with real tires, real suspensions and common engine modifications. When’s the last time you’ve seen a bone-stock Miata at an autocross or track day? Exactly. Other outlets have written this headline. But they haven’t written this story. A story like this doesn’t start with calls to Fiat and Mazda. Instead, it started with a call to a racer, in this case Brian Goodwin, owner of Miata tuning firm Good-Win Racing and a fast driver himself. He already owned examples of both cars, and was willing to prep them identically for our test. Even better: He’s located near the Streets of Willow Springs, the twisty, hilly track located next to Southern California’s Willow Springs Raceway. “Identically modified” isn’t something you can ask for a few hours before your session. It’s something that takes weeks to achieve, and Good-Win put in the time to make sure it was done right on our test vehicles. A full list of the modifications made to each car can be found at the end of this story, but overall we aimed for a setup that would roughly approximate that of a front-running Street Touring autocross car, albeit with a few track-focused additions, like the Blackbird Fabworx RZ roll bars. The only differences came when it was time to modify the drivetrains, since propulsion is the primary mechanical difference between the two cars. The Fiat received a bevy of parts aimed at pumping up its turbocharged heart, while the Miata got a heavy dose of naturally aspirated breathing modifications. Once each car was back from the shop, Good-Win Racing spent time with each on track and on the dyno, optimizing their suspension and engine tunes to ensure a fair fight. Each car was then given a fresh set of BFGoodrich g-Force Rival S tries, loaded into its trailer, and brought to Streets of Willow. We checked tire pressures in the paddock, torqued the lugs, and rolled out for our first session. We split the driving duty with the team from Good-Win, giving everybody the chance to drive each car and ensuring that plenty of laps were put onto both chassis. 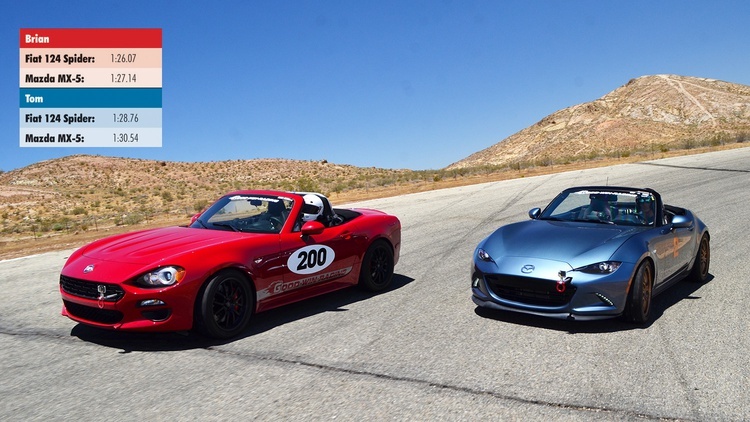 A coin toss determined that we’d spend our first session in the MX-5. Our goal? Get reacquainted with a chassis we’ve already got plenty of seat time in, and learn the bumpy, challenging track. Although we’ve spent lots of time in the ND-chassis Mazda MX-5, we’ve never driven one this well composed, or with this much power from the factory, naturally aspirated engine. Good-Win’s fancy exhaust seemed to plump up the stock MX-5’s powerband, making a broad, linear curve. We knew exactly what was under our right foot at every step around the track, and managing the car’s oversteer was a breeze, even door-to-door with other cars on the unfamiliar circuit. Clearly, Brian likes a bit of tail-happiness in his race cars. This was our first outing on the Ohlins coil-overs, and they avoided the common “ALL THE SPRING RATE” pitfall that Miata owners seem unable to avoid. The car was compliant around the bumpy track, and simply stuck. We did have a few gripes. The only word we’d use to describe the steering and shifter feel is “dainty,” which isn’t exactly confidence-inspiring at 10/10ths. Brian says that the MX-5’s steering actually gets lighter as tire grip increases, a byproduct of the electric rack trying its best to do its job. The MX-5 also lacked low-end torque. That’s not normally a problem on a high-revving track car, but we caught ourselves downshifting to second in a time-wasting attempt to keep the engine in its power band. We had learned the track. And we had learned what the newest Miata felt like in Street Touring trim. Time to see if the challenger from across the pond (though 124 Spiders are actually assembled in Japan) would hold its own. 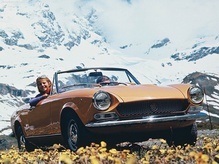 Now, time for a disclaimer: We’ve driven the 124 a lot in stock trim, and stock for stock, all-season tires and all, some of us in the office would pick the Fiat over the Miata in a heartbeat. This opinion hasn’t made our group super-popular among the rest of the GRM staff, but those who like the Fiat stand by that choice, pointing out the fact that the boost simply makes the car more fun. Sorry to spoil the surprise, but that opinion didn’t change on track. Sure, our laps started off with a sad realization: Pressing the gas in the MX-5 is like ordering a lightning strike, while pressing it in the 124 is like ordering a flood. There’s definitely some turbo lag here, but after a lap or two we learned to keep our foot down and the turbo spooled. With that problem solved, we hit the next obstacle: 6000 rpm, and not a tick past it. Sure, the Fiat would rev that high, but why bother? After a session spent trying our best to throw the MX-5’s pistons through the hood, the Fiat asked us to drive it more like a diesel truck. Fine. After a few more laps of adjustment, we wondered how we’d ever go back. Sure, we noticed the Fiat’s extra weight (not quite as much as a passenger riding shotgun), but we were no longer worried about that split-second of extra time changing direction. The MX-5 demanded absolute precision and planning, but the Fiat was more like a little muscle car, with torque and power the MX-5 would never even dream of at 4500 rpm and exactly as much mechanical grip once you steered it into the corner. Bonus: The Fiat’s steering is heavier, thanks to different programming for the MX-5’s too-light rack. The shifter feels better, too, which makes sense: 124 Spiders use the transmission from the earlier NC-chassis Miata, meaning meatier throws and better longevity, at least if the anecdotes from racers are true. Oh, and can we talk about the sound? Wow. The Fiat sounds like a bull snorting wasabi, and everybody knows turbo noises are cool, too. 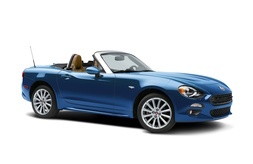 Picking a Winner: Mazda or Fiat? We spent the rest of the day rotating between the two cars, and were well sunburned for our flight home. Those hours of track time backed up our initial impressions: The MX-5 in race trim is the finely sharpened scalpel it’s always been, while the Fiat 124 is like that scalpel with a cool flame job on it–and maybe the surgeon drank an energy drink on his way to the O.R. It’s the Miata, but more Italian (though you already knew that). This story isn’t just about touchy-feely driving impressions, though: It’s about lap times. We left that answer for the end of the day, after we’d written down our driving impressions. 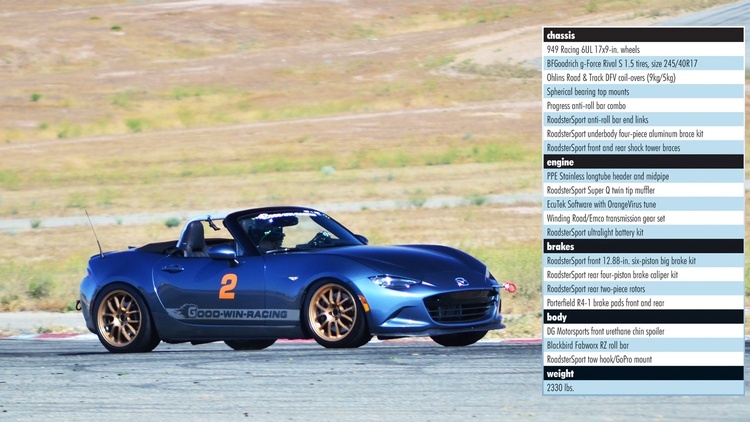 Then we pulled the AiM data loggers out of each car, and discovered that the numbers backed up our subjective analysis: The Fiat posted a best time of 1:26.07, while the MX-5 turned a 1:27.14 fast lap. That was no fluke, either, as we saw consistently faster times from the Fiat. Case closed, album finished, video wrapped. 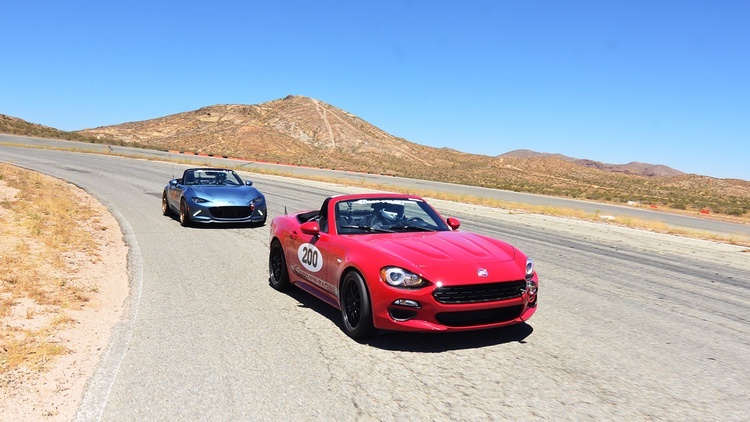 We’re calling this one a win for the Fiat 124 Spider, at least on the open track. On a tight autocross course, the answer may be different, owing primarily to the Fiat’s extra weight and turbo lag. But that answer will have to wait until next time. 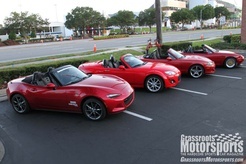 Join Free Join our community to easily find more Fiat and Mazda articles. 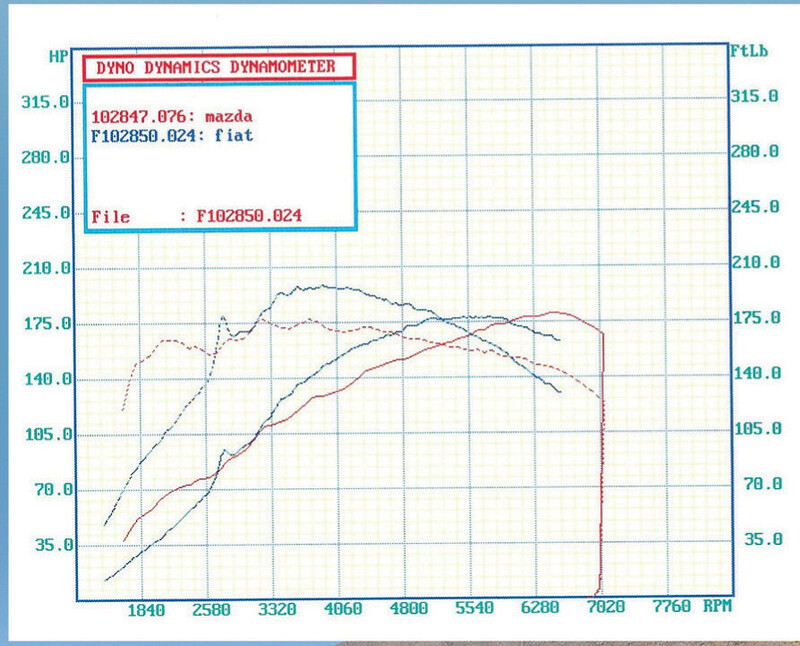 Do we know the dyno numbers of both cars? I'd be interested to see how much extra power the turbo 4 put down. Bolt ons with NA 4 cylinders always seem so trivial over stock that I'd probably put that money for a header or intake towards suspension or brakes. The turbo on the other hand with a tune and exhaust could free up 50+ hp and that could be worth it. Yep, they'll be posted shortly. Yep, that's a fat bump in the mid range when boost comes on. I like it. And the Fiat is just better looking in my opinion. I just wish they hadn't stuck to the small capacity (1.4) 160 bhp engine. They had the chance to do what they have always been strangely reluctant to do - offer a performance version of the Miata. It would have been so easy to just take their existing Mazdaspeed turbo engine (2.3) that they used up to 2013. They put out a very useful 263 bhp and would only have required some pipe rerouting to change from a transverse to an in line engine location. The Fiat needs a Fiat motor, otherwise it's primarily just a styling exercise. But otherwise I very much agree. If you've already engineered the platform, body, et cetera, why not offer a giant-killer edition? And since the Fiat can be pumped up relatively easily, Mazda runs the risk of watching their cars getting beaten regularly by 230 HP Spiders. So now what I want to know is if the Abarth is worth the extra money if you are going to improve the car for track use? 160 HP VS. 164 HP, and the Abarth has Bilstein stuff under it. But, anyone buying one of these with the intent of track and autocross use would find that 4 HP and put some suspension and tires/wheels on it anyways. I won't be buying one of these until they start showing up used, and I am hoping enough 124's sell (and with manual transmissions) that I'll have several to choose from when I go shopping. Absolutely not worth the extra money–everything the Abarth gets you is stuff you'll be throwing on the scrap pile, anyway. The Fiats aren't selling well, and the Bilstein suspension on the Miata is nothing to write home about. In my experience, the one to get for track use is the base model Miata. I think the people who are attracted to the Fiat brand got tired of waiting for them to come back to the USA and just stayed home and bought the new Ipad instead. Also, when I look at the Fiats they sell at my small town Jeep/Dodge dealer, the salesman's attitude changes whe they find out your looking at 124's for yourself and not you wife/daughter. I'd say the MX-5 would be the preferred track weapon, but for street use, I think I'd side with the 124 Abarth. The Fiat has a "specialness" that the Mazda lacks. I prefer the Mazda's engine and power delivery over the turbo Italian's though. I actually prefer the Mazda's styling, but it's also WAY more common and you'd see yourself coming and going all the time. I really enjoyed my time in a 124 Abarth. The car grew on me as the miles rolled on. The interior (although nearly identical to the Mazda's) just feels better, more upscale. Maybe it's the different seat coverings, or the gauges. Something about that car makes it feel more precious than it is. Not the Club? I was thinking the LSD made that package worth it. The more time I spent in the Fiat, the less I liked it. I couldn't get past the drivetrain or the handling effects of having 100 lbs of extra weight on the front axle combined with sluggish power delivery. Ours was just a Classica, which meant that the difference between it and the Miata interior was basically nil other than a font choice on the gauges and that didn't make it special enough. Did you notice the optical illusion on the Fiat hood that makes it look like a Lincoln Continental? The LSD is the only real version to go with the Club, unless you really want the infotainment system and cloth seats. On track, I don't miss the LSD much. Autox would be a different matter. As much as I like the Miata better, I wonder if the 124 isn't the one to buy used. At least where I live there seem to be a couple 124s with nice savings to be had, whereas the Miata doesn't seem to depreciate. Great article. I'd have to do a little research into the potential of the 1.4 to figure out how interesting the 124 really is. As it sits i do think it looks better than the Miata. I also want to know how much of the 100 extra lbs on the nose is easy to fix. I've seen NDs for sale at dealers for under $20k with four-digit mileage. There are deals to be had. Everything you can do to pull weight off the nose of the Fiat also works on the Miata, FYI. There's simply more nose on the Fiat. The Miata engine is also crazy light, you need to see one out of the car to understand how much work Mazda put into weight savings on that thing. I got to flog an RF at the Challenge, and even though it was an automatic it was still as 100% Miata as my 96 was. Also, even on General all-season tires I think most of us put down faster times in the RF on a single run than we did in our own Challenge cars.